are underground structures that disposes stormwater runoff, by dissipating it into the ground, where it merges with the local groundwater. Water from downspouts should be carried away from the foundation walls. If not, you may end up with a damp or wet basement. In rural areas this water can be drained to nearby streams or ditches. If this is not possible, a dry well can be installed. Dry-well. A dry well is a gravel filled container buried about 20" (500 mm) below the surface and located no less than 10 ft. (3m) away from the house. Dry wells spread the water over a large area. Simple dry wells consist of a pit filled with gravel, rubble or other debris. Such pits resist collapse, but do not have much storage capacity because their interior volume is mostly filled by stone. 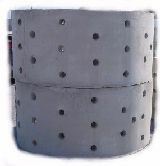 A more advanced dry well defines a large interior storage volume by a reinforced concrete cylinder with perforated sides and bottom as shown on the left. - Loosely laid cement blocks as illustrated on the right. - Pre-cast concrete as shown on the left. - A large perforated drum. - Wire mesh, landscape fabric, or any other webbed material.